Gulas 2002). The latter may be a junior synonym of either Argillipes paralectoris Harrison and Walker, 1977 or A. aurorum Harrison and Walker, 1977 from the same locality (Fig. 6.4; Mayr 2005a). Oligocene of Nebraska (Mayr and Weidig 2004; see Sect. 6.1.3). 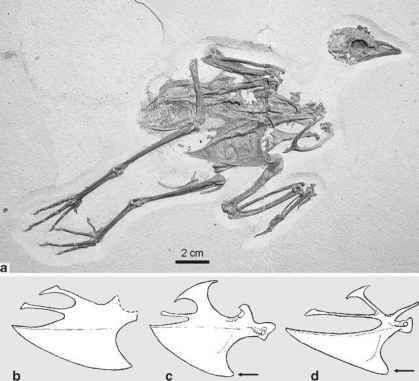 Legs of a putative galliform bird were described by Lindow and Dyke (2007) from the Danish Fur Formation; whether these can be assigned to the Gallinuloididae, as assumed by Kristoffersen (2002a), needs to be shown by more complete material. Gallinuloidids are the only stem group representatives of the Galliformes which are known from well-preserved skeletons. Although the skull of G. wyomin-gensis resembles that of extant Galliformes in overall morphology, the postorbital processes are less developed and there are no ossified zygomatic aponeuroses, which are a derived characteristic of many extant Galliformes (Mayr and Weidig 2004). As in the Paraortygidae (Sect. 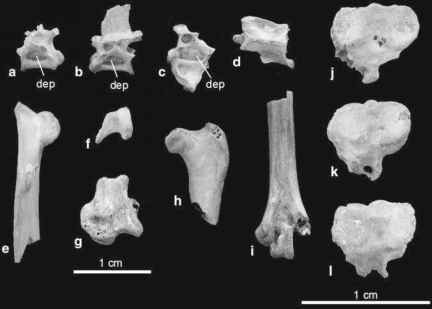 6.1.2) and some extant galliform taxa, the humerus exhibits a well-developed second pneumotricipital fossa. Otherwise, however, the pectoral girdle and wing skeleton of gallinuloidids display a plesio-morphic morphology, which is quite different from that of their extant relatives. 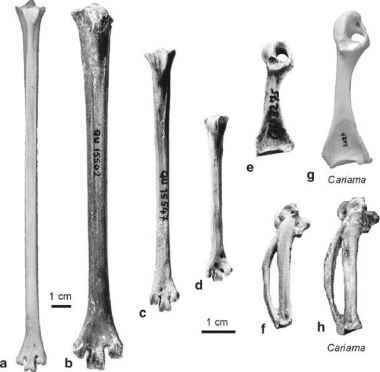 The humerus is less robust than that of crown group Galliformes, and especially the proximal end is more similar to that of to ducks (Anatidae) in its proportions. The shorter and more protruding deltopectoral crest in particular shows that gall-inuloidids are the sister taxon of all other galliform birds (Mayr 2006b). As in the Anseriformes and other stem group Galliformes (see below), the coracoid of gallinuloidids exhibits a plesiomorphic, cup-like scapular articulation facet. The very long scapula and the long and slender carpometacarpus are also more similar to the corresponding bones of anseriform birds than to those of crown group Galliformes (Mayr 2000b; Mayr and Weidig 2004). The shafts of the furcula are much wider than in crown group Galliformes, and the tip of the sternal carina reaches farther cranially (Mayr 2006b). The bodies of the thoracic vertebrae bear marked lateral depressions (Fig. 6.4; Dyke and Gulas 2002), which also occur in Mesozoic stem group representatives of Neornithes (e.g., Ichthyornis; Clarke 2004) and the anseriform Presbyornithidae (Sect. 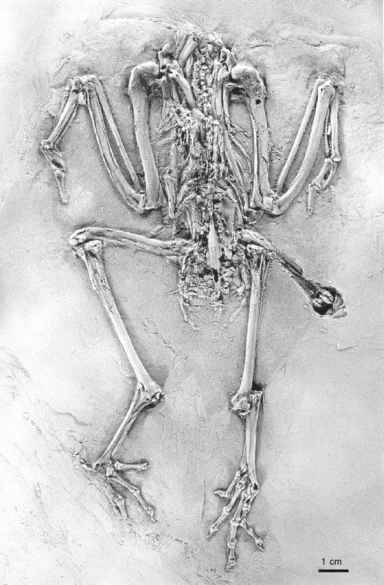 6.4.3), but are absent in extant Galliformes. Most earlier authors (e.g., Tordoff and Macdonald 1957; Brodkorb 1964; Ballmann 1969a; Dyke 2003b) considered G. wyomingensis to be a representative of either the Cracidae or the Phasianidae, i.e., assumed a position within crown group Galliformes. Because of the poor preservation of the holotype specimen, this misclassification is comprehensible. I find it more difficult to understand, however, why a position within crown group Galliformes was still advocated for gallinu-loidids by Crowe et al. (2006), and Dyke and Crowe (2008), especially in light of the fact that Dyke and Gulas (2002) agreed upon a position outside crown group Galliformes for the very similar Paraortygoides. The very robust furcula and cranially protruding tip of the sternal carina (Fig. 6.2) indicate that gallinuloidids had a less voluminous crop than their extant relatives (Mayr 2006b). Their vegetable food component thus probably consisted of fruits and other easily digestible plant matter, rather than coarse material such as seeds. This assumption is in concordance with the fact that in none of the known specimens of the Gallinuloididae gastroliths are preserved, whereas extant Galliformes regularly ingest grit and small pebbles to mechanically break down plant matter in the gizzard.